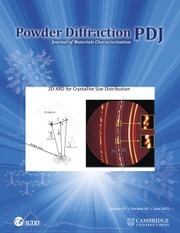 ICDD’s quarterly, (and a special topical issue) international journal, Powder Diffraction, focuses on materials characterization employing X-ray powder diffraction and related techniques. With feature articles covering a wide range of applications, from mineral analysis to epitactic growth of thin films to advances in application software and hardware, this journal offers a wide range of practical applications. ICDD, in collaboration with the Denver X-ray Conference Organizing Committee, has increased services for the subscribers of Powder Diffraction and authors of Advances in X-ray Analysis. Beginning in 2006, ICDD offered a copy of the previous year’s edition of AXA to Powder Diffraction institutional subscribers who receive both print and on-line versions. This effectively doubles the number of articles annually available to Powder Diffraction subscribers and significantly increases the circulation for the authors in Advances in X-ray Analysis. Subject coverage includes: •Techniques and procedures in X-ray powder diffractometry •Advances in instrumentation •Study of materials including organic materials, minerals, metals and thin film superconductors •Publication of powder data on new materials Authors, subjects and page numbers are listed in the past issue content pages. Authors should read Notes for Authors for information on the scope, categories, manuscript preparation and submission to Powder Diffraction. R factors in Rietveld analysis: How good is good enough?